The Book of Odes (Greek: Ὠδαί), commonly referred to simply as Odes, is a book of the Bible found only in Eastern Orthodox Bibles and included or appended after Psalms in Alfred Rahlfs' critical edition of the Septuagint, coming from the fifth-century Codex Alexandrinus. The chapters are prayers and songs (canticles) from the Old and New Testaments. The first nine of them form the basis for the canon sung during matins and other services. 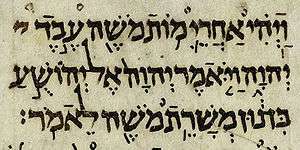 James A Miller, "Let us sing to the Lord": The Biblical Odes in the Codex Alexandrinus (January 1, 2006). Dissertations (1962 - 2010) Access via Proquest Digital Dissertations. Paper AAI3231313. James Mearns, The Canticles of the Christian Church, Eastern and Western, in Early and Medieval Times, Cambridge University Press, 1914. Henry Barclay Swete, An Introduction to the Old Testament in Greek, Cambridge University Press, 1914, page 253.